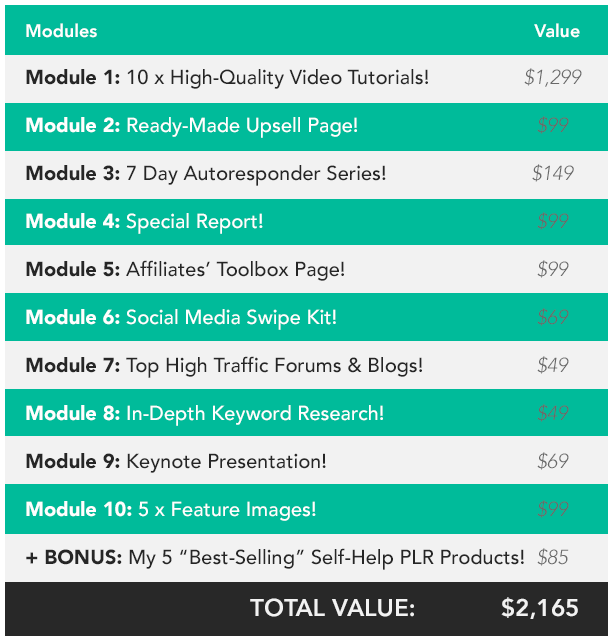 "Get Instant Access To 10 Video Tutorials With PLR, 7 Pre-written Auresponder Messages Plus 8 More Power-Packed Modules To Generate Even More Leads & Sales..."
Finally! Now You Can Get The Unfair Advantage! Congratulations on getting your hands on the private label rights to Never Say Later, which includes the essentials for reselling it for profit. 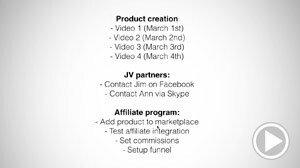 10 EXCLUSIVE modules that will increase your profits, build your list of subscribers and authority in the marketplace. Here it is! 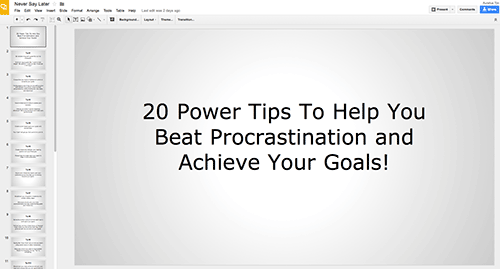 10 video tutorials on the topic of procrastination and productivity -- the perfect compliment to the Never Say Later PLR package. These high-quality HD videos were recorded by me (Aurelius Tjin), based on my own knowledge and experiences. These are STUDIO QUALITY videos and I use high-end recording equipment and software, from the microphone to the recording software. Rebrand these as your own as I did not put any credit or branding at all. 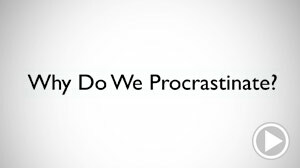 Video #10: Why Do We Procrastinate? We've done it all for you. 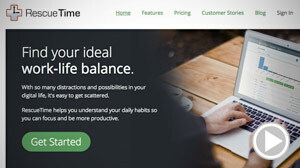 Simply add your order button and add this page as your upsell for the Never Say Later product. 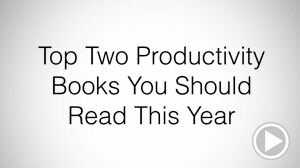 This is a special 7 day autoresponder series that shares tips and techniques around the topic of productivity and motivation. 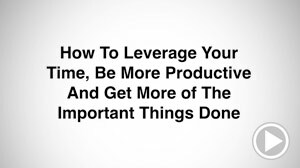 The aim is to give value and subtly promote the Never Say Later guide. 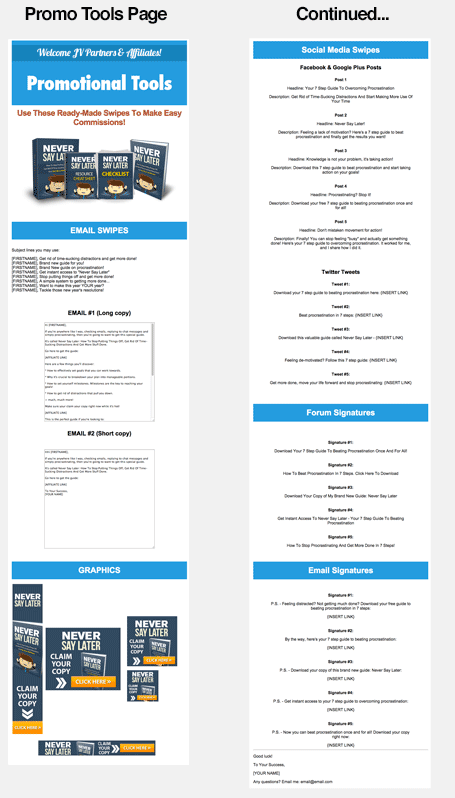 These emails have the "useful but incomplete" feel to it. 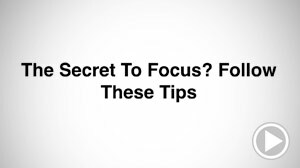 Your subscribers will get so much value from every email and will want to buy the main product. Written in an authentic, friendly angle - subscribers connect better when you know how they feel. 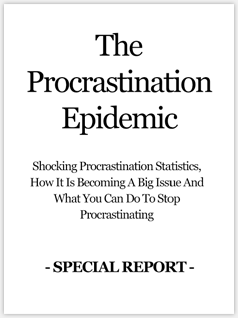 This 7-page special "whitepaper" report details shocking facts and figures around the procrastination problem. 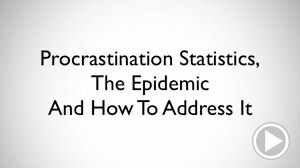 Giveaway this report to your subscribers as a free gift so that they can see just how big of a problem procrastination is. This report educates them on the subject and makes them aware of the issue. 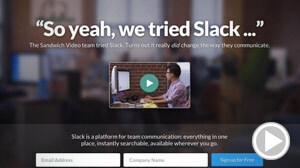 The Never Say Later product is featured as a recommend resource at the end of the report. 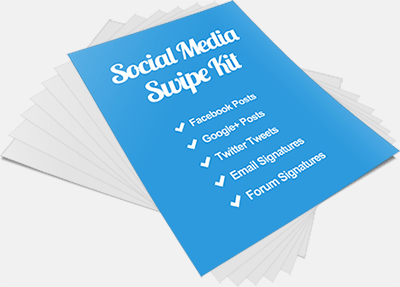 Use this swipe kit to promote Never Say Later in social media. 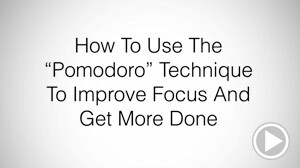 We've found some high traffic forums and blogs around the same niche of "Procrastination", "Motivation" and "Productivity", where you can get traffic from. 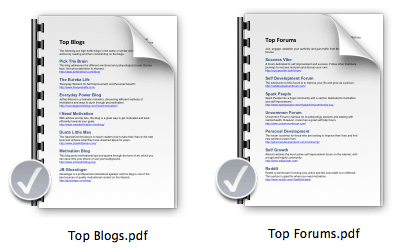 Provided in 4 formats: Powerpoint, Keynote, PDF and Google Presentation. Use these feature images to promote your product on your Thank You pages, blog, social media and more! 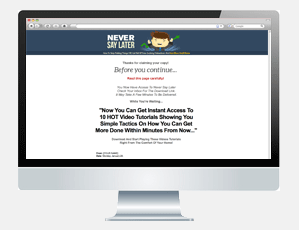 Get Instant Access To The Never Say Later GOLD Package Right Now! 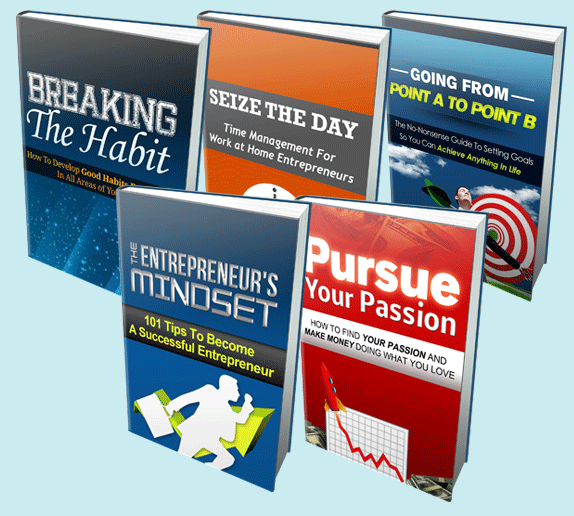 Get My 5 "Best-Selling" Self-Help Products With 100% Private Label Rights! 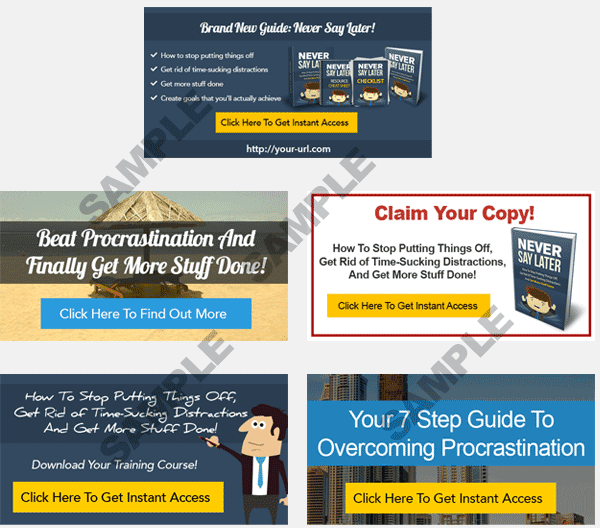 Instant access to my 5 top self-help PLR products. 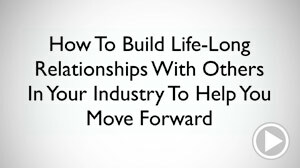 If you bought each of these PLR products separately, it would cost you $17.00 each. That's a total of $85.00 if bought all together! 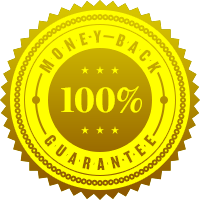 As this is a special ONE TIME OFFER, you can get instant access to all 10 power-packed modules for just a measly $197 $47 (SAVE $150)! 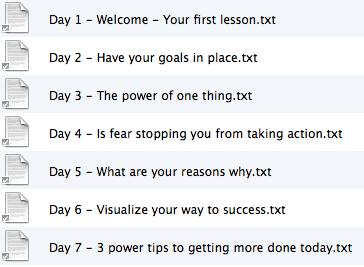 You'll Get Instant Access To All 10 Modules, Even If It's 2AM On a Monday!